We have to have Wi-Fi available everywhere — I have withdrawal symptoms if I can’t do my email and check the web often. 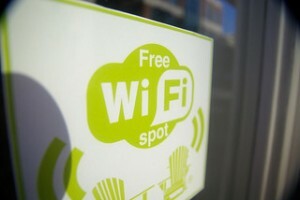 Recognizing this, many stores offer customers “free” Wi-Fi. I’m sure the cost of the Wi-Fi is passed onto the customers as higher product prices, in what are typically competitive retail industries. But how to avoid people spending hours in the shop surfing the web free of charge, and perhaps causing congestion for other users? The Whole Foods store on Kensington High Street in London has solved this problem by allowing each computer or smart-phone a two-hour log on period, after which the device is booted off the Wi-Fi. Two hours are enough to satisfy almost any customer, but short enough to prevent non-customers from making the store their Wi-Fi venue of choice. I expect this kind of limit will become more widespread shortly — it is much more effective than warning people not to stay logged on for very long. Seems silly to me. I can't imagine that internet connections for this type of establishment make up a significant portion of their costs. The marginal cost of the bandwidth used by a freeloader is small. Smaller than the expected profit of a purchase by them, even if the probability that they will purchase anything is very small indeed. If they are imposing that limitation to keep the "wrong type" of person away for other reasons, then it might make sense. I do not think this sort of technic will be adopted in train stations, noone willingly stays ages in a train station, just because there is free wifi. However, if you run a coffee shop or sth similar you can avoid the confrontation with the customer, which might give the shop keeper a bad image even though he is right. So my point being it is not about the cost of the internet to the shop, why this setup makes sense. It is to ensure the space is more efficiently used by paying customers and free riders have no incentive to take up their space for very long. The cost of WiFi is essentially nothing. It's less than 10% of the cost of credit card merchant fees for most small businesses, and has zero impact on pricing. The cost of having a person camp out in your space, taking up a seat and not having that seat available for a new person to come in and spend money...that is a real cost....the cost of lost sales. I've seen a better solution at a few cafes. Receipts for a purchase will include a code that provides access to the cafe's wi-fi for 90 minutes. Not only does this limit time any one person can spend on the wifi, but it also requires all wi-fi users to spend money at the cafe. I like that idea. I don't like it when somewhere has free wifi, and then you have to sign-up to an account to use it. You may only use this connection once, or once every month, and then the next cafe demands you sign up to a different account. I just use my data allowance if I have to sign up. For an example here in the UK, Costa coffee uses O2 Wifi, while Pret a Manger uses The Cloud, O'Neills'“AP PARAGON” – require your name and email address every time you connect, while Café Rouge use O2, but you’ll need a mobile phone: they send you a text. I just can't be bothered, a receipt with a one off code would be perfect. This always bugged me about a Panera near where I live. Multiple times, I was forced to take my business elsewhere as I got to the restaurant at the lunch rush only to see that all the tables were being used (typically, one person, drinking a coffee and taking multiple spots at a table due to books, laptop, etc). I also witnessed several other people, turn away. I always wondered if the increased business from the free wifi was worth the loss of business due to there being nowhere to sit. I'm assuming it was not, as they finally put in a 30 minute wifi limit during lunch. Paneras near me -- Sarasota, FL -- have time limits on WiFi. You get an hour then you get booted off. I spent a few weeks in Bulgaria and it seemed to me that EVERY public establishment had a free wi-fi—Cafes, bars, restaurants, libraries - it was like table stakes for opening the business. Also, the Internet is VERY cheap and VERY fast - download speeds of >50 mb/s (that may have something to do with the wi-fi proliferation). Same in all the Baltic states. Free and fast WiFi at bus stations in small towns which were built during the Soviet Union and look like it. Nice contrast to Western Europe. Prob is, the way wifi works now that'd be trivial to defeat from the command line, and if it were a common prob there'd be a million apps to do so. Expiring wifi codes seems like the way to go. That or hard limits on table occupancy during busy periods. I kinda like the latter, if biz is slow maybe they shouldnt care that Im on their wifi for 3 hours and only bought $15 worth of stuff over that time. Whereas camping at the table for 2 hours during the rush grading papers or socializing is as bad as sucking on the wifi. Providing wi-fi at a business or establishment is often designed to "attract" customers to the shop, at a very low cost. Many establishments benefit from having people come in and camp out on the wi-fi for extended periods, after all, who wants to walk into an empty store...people attract people. Look at Starbucks success, from the beginning they tried to create an environment for people to hang out, meet up with friends, conduct face to face business meetings. I wouldn't consider those that you describe as "Free Riders", I'd consider them as "customer magnets. There's a restaurant I love in Houston, called "House of Pies." They have a $5 an hour fee if you are not eating / sharing a meal, and if you stay more than an hour after you've finished eating. It only applies during the restaurant's peak hours, though. Before the Caribou Coffee down the street from me closed, I used to spend 3-4 hours a day at a small table (2 people) during the bi-annual finals week. I never thought about it in the way the article and comments assert because so many others do it. It almost seems that the internet accessibility was what drove some of the business at Caribou. Totally different, more professional and grown-up atmosphere at Caribou as opposed to that *other* nationwide coffee shop chain. I'm still refusing to make the switch. You have Wi-Fi everywhere? (´_ `) In Japan, public Wi-Fi is just about impossible to find. The few places that have it (e.g. some Starbucks stores), you have to go up to the counter and get the logon information. A vending machine has it. Otherwise, Wi-Fi in retail hasn't happened here. This is not new or innovative? Some Peets & Starbucks have per purchase time limits. McDonalds ex-USA lets you use it as much as you want, but you only get 50MB per session. You can login again, but it's annoying enough that you wouldn't really want to do that all day if you were free-riding. And downloading kills your allowance immediately. The Whole Foods store on Kensington High Street in London has solved this problem by allowing each computer or smart-phone a two-hour log on period, after which the device is booted off the Wi-Fi. This is the sort of thing I'd feel compelled to beat. Probably just by changing my MAC address -- takes two seconds from the command line on linux, IIRC easy to do on Windows, too. The irony of course is that I'd never want to step foot in a Whole Foods, much less spend more than two hours there, except that I'd feel obligated to beat their wi-fi restrictions. Irrational to the point of pathos I know. At KFC in Australia, the free wifi allows 15 minutes access. This is enough for most people visiting a QSR. They allow this time to be extended to 1 hour if you 'sign in' which requires you to enter some basic demographic information (age, postcode, gender) and your email address. There is also a checkbox to opt in for email newsletters. The sign in page also features promotional product ads. « Previous PostHow to Get Motorbiking Parents to Put Helmets on Their Kids?